The Port Welcome sailed Baltimore harbor for many years. 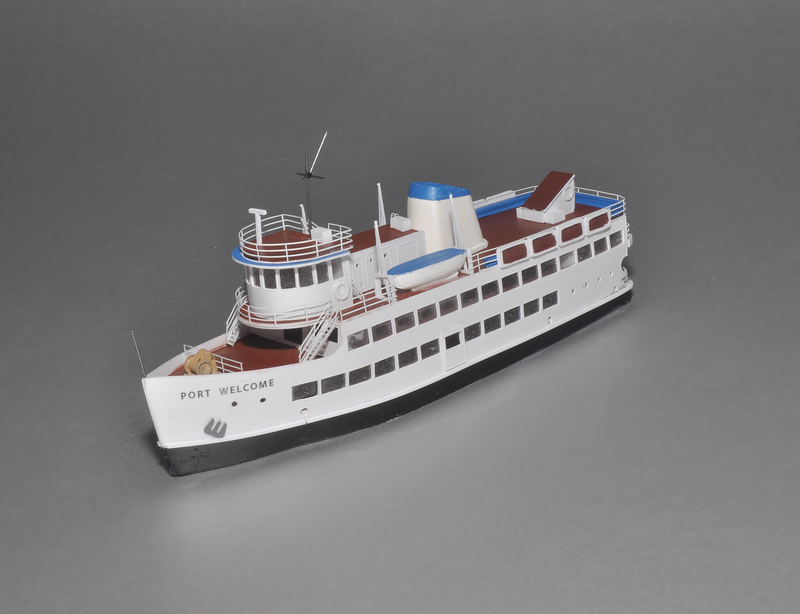 The Port Welcome in Z scale, all of 7″ long but as detailed as any larger ship. The main and 01 decks are see-through, as is the pilot house! Add your own interior details, from tables and chairs, to the concession stand, to lots of people. I’m proud of the techniques I’ve developed to be able to do this. 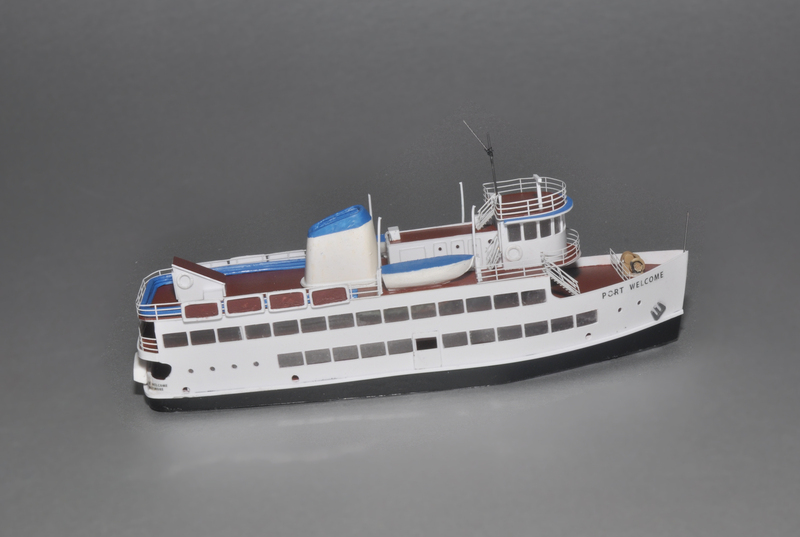 Yes, those are Z scale railings, stairways, anchors, life rings, life rafts and life boats, along with custom built davits, and a cast resin stack—all designed for my Z scale ships. 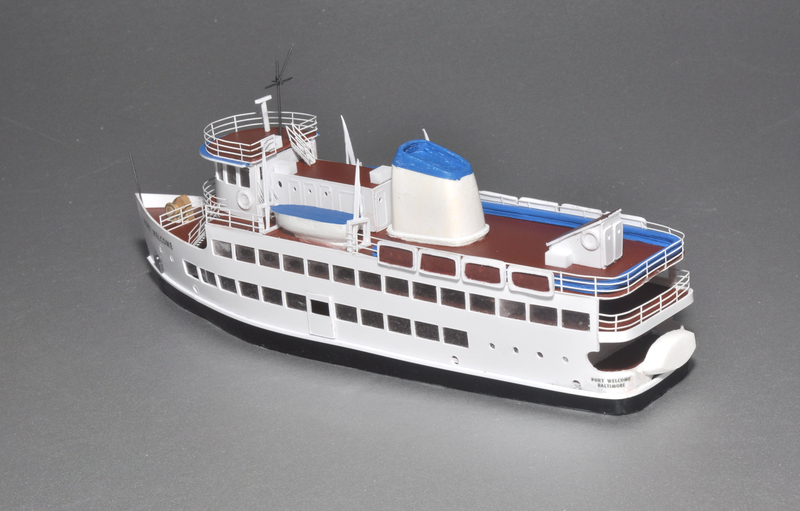 There’s also the wrap-around seating on the top deck, storage lockers, masts and flag staffs. Those are custom lifeboats and dinghy, hot out of my molds. Notice the stack has a hollow shield on the top, which I manufactured from many layers of styrene, each reduced incrementally by the computer. The kit will be $125, plus $10 shipping in the US. Built ups will be $550, plus shipping. I’ll produce only 30 kits for this Fall, and my schedule for built ups is filling up quickly, so order now if you’d like one for Christmas! Order cut-off for guaranteed delivery in 2013 is October 15.. I do not have an ordering system on this site yet. I can accept Paypal and credit card orders. Best to contact me at peterknolan@gmail.com.